Dry rub catalog and recipe book. Free recipes. Recipes for Beef Roast with Cracked Pepper Crust, Honey Orange Slaw, Chipotle Mashed Potatoes and more. If you enjoy more than great recipes but quality ingredients, our catalog adds spice to cooking just as you will do with our dry rubs. Discover new ways to enjoy Knox's dry rubs along with a bit of BBQ history included as well as a few cooking tips. You also receive Knox's Home Made BBQ Sauce recipe in our catalog. Provided, for the most part by Tim Knox, is thick and rich with a depth of flavor that will surely have your guests asking. We have used this sauce for ribs, chicken and even as a sandwich dressing, but also use it as a spread or dip. 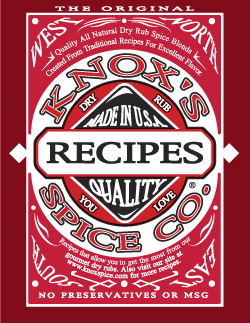 Download the "Recipes of the Knox Spice Company" by clicking here. Free, nothing to sign up for. This recipe pamphlet also come with every order. 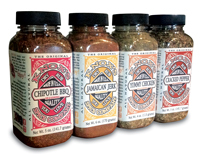 Visit our BBQ dry rubs recipe section for more recipes and cooking tips. Visit our blog for more recipes and cooking tips. BBQ rub, it's not just for breakfast anymore. Also make sure to see our gift basket, excellent for father day present, house warming or closing gift.